Cuban born Arturo Fuente (1887-1973) opened his first ciga factory in West Tampa in 1912 at 1804 Habana Ave. on the NW corner of Habana Ave. and Union St. operating as A. Fuente & Co. The history of Arturo Fuente can be seen on this YouTube video interviews with Caros Fuente. In 1920, Arturo moved to the corner of Albany Ave. and Nassau St. and the following year began to produce the Miss Tampa brand cigars. The firm merged with Salvador & Rico and produced brands USA-CUBA, Flor de Salvador Rico, Flor de Rico, Tampa Elite, Fuente, Garcia Bouquet, and Tampa Sweethearts. As a result of the factory burning down in late 1924, the Arturo Fuente brand was out of production for 22 years, re-emerging in 1946 as Arturo Fuente Cigar Co. with limited production in Arturo Fuentes' house where they stayed until the early 1960's. Carlos Fuente (1935- ) acquired Arturo Fuente & Co. from his father in 1956 and continued to operate out of the house. 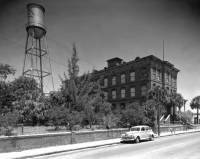 In the early 1960s having outgrown the facilities at their home, Carlos Fuente acquired a two story facility on 13th Avenue in Ybor City which was shortly thereafter expropriated for the construction of I-4. Carlos then moved the factory to a building on the corner of 18th Street and 17th Avenue which facility they had outgrown by 1965. That's when in 1964 Carlos Fuente had the opportunity to buy the Charles the Great Cigar Factory Building pictured below which name Charles the Great was given after Rodriguez’s best well known cigar brand. This four-story 22,602 square foot brick building at 22nd Street and 3rd Avenue in Ybor City was built for Salvador Rodriguez , maker of the Charles the Great, Da Vinci and Salvador Rodriguez cigar brands. It is sometimes reported built in 1902 and sometimes in 1903 while according to Hillsborough County records, it was built in 1895. Salvador Rodriguez moved to this location from his previous factory in Palmetto Beach where he had been since 1891. After approximately 21 years manufacturing cigars at his new location, in 1924 Rodriguez sold the factory building and the rights to all his cigar brands to Francisco Sierra who had parted way from his family's business at Corral-Wodiska & Co. He continued to operate the factory until it was no longer profitable and in 1951, 3 years after his death, the building was sold to the DeSoto Shoe Service whose business did not last and who abandoned the building in 1955. Since 1964, the factory building has been owned by the Arturo Fuente family, today by Arturo Fuente Cigar Factroy, Inc. In 1974 due to inflation and the lack of skilled cigar rollers, Carlos Fuente decided they had to move the company abroad. For a short time they manufactured cigars in Puerto RIco and Mexico and explored possibilities in the Dominican Republic before deciding to settle in Nicaragua. They operated in Nicaragua until 1978 when due to the Sandinista political unrest there their factory was burned down. They then established a factory in Honduras but this time due to an accidental fire the factory burned down one year later. In 1980 they moved the company to Santiago in the Dominican Republic where they still operates under the leadership of Carlos son Carlito Fuente (1954- ). Carlos brother Arturo Fuente, Jr. incorporated the Tampa Sweetheart's Cigar Company on January 2, 1969 and stayed in the building until 1994 when he retired. Today, the Tampa Sweethearts Cigar Company is still in business, selling cigars rolled in the Dominican Republic by Tabacalara A. Fuente y Compañia and others. The building sits on a hill in Ybor City, the historically Cuban neighborhood of Tampa, Florida. It has been recently remodeled by Robert Holsopple who states that it is probably the most extensive restoration of a historic building ever in Tampa bringing it back to where it was in its heyday. The building will house the Fuente companies administrative offices in the USA including the Cigar Family Charitable Foundation. Much of the inside has been restored from original and period wood and architectural details. It has been finished with art representing the history of the company and its founders.